Confederate States of America A Digest of the Military and Naval Laws of the Confederate States, From the Commencement of the Provisional Congress to the End of the First Congress Under the Permanent Constitution. 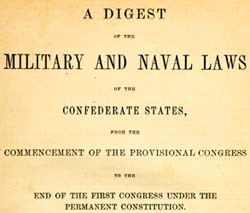 A Digest of the Military and Naval Laws of the Confederate States, From the Commencement of the Provisional Congress to the End of the First Congress Under the Permanent Constitution. Columbia: Evans and Cogswell, 1864. Military law -- Confederate States of America. Naval law -- Confederate States of America.